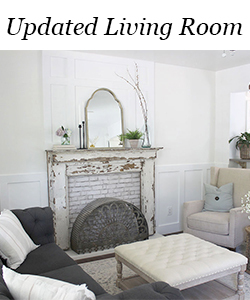 I’ve made a few small changes to my family room since I last shared it on the blog. Although there still are several things to do in here, I thought I’d show you the progress so far. We changed out the coffee table. We had a bench in here before that was just pulled from my daughter’s room temporarily. The bench was a little too small for the space. This table isn’t new, it was in our living room before. When we put up our Christmas tree, me moved it in here and decided to keep it here. The table is from Pottery Barn, I don’t think it’s available any more. 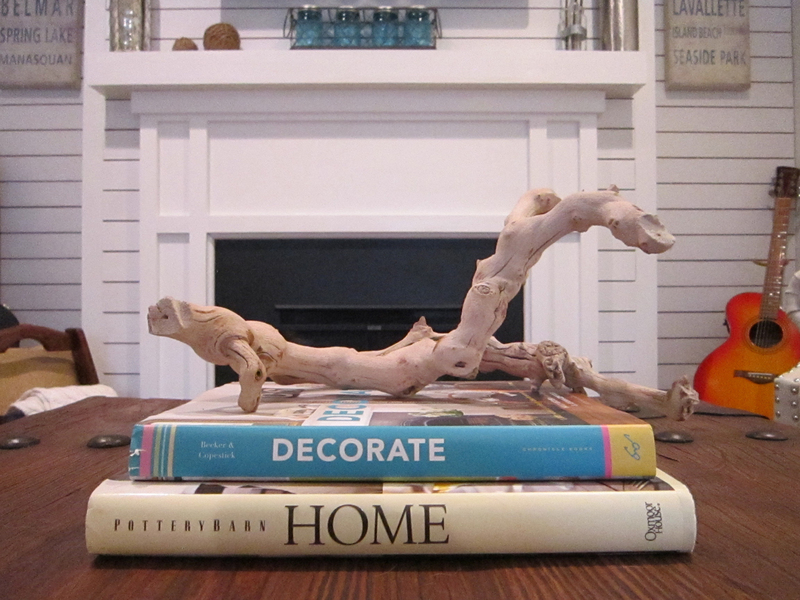 I styled the coffee table with some drift wood I picked up at Home Goods. And a little grouping of candles with a white ceramic picture, also from Home Goods. This wall above the chairs is still empty. I just haven’t found anything that I love enough to put up there yet, so I’m not going to rush it. 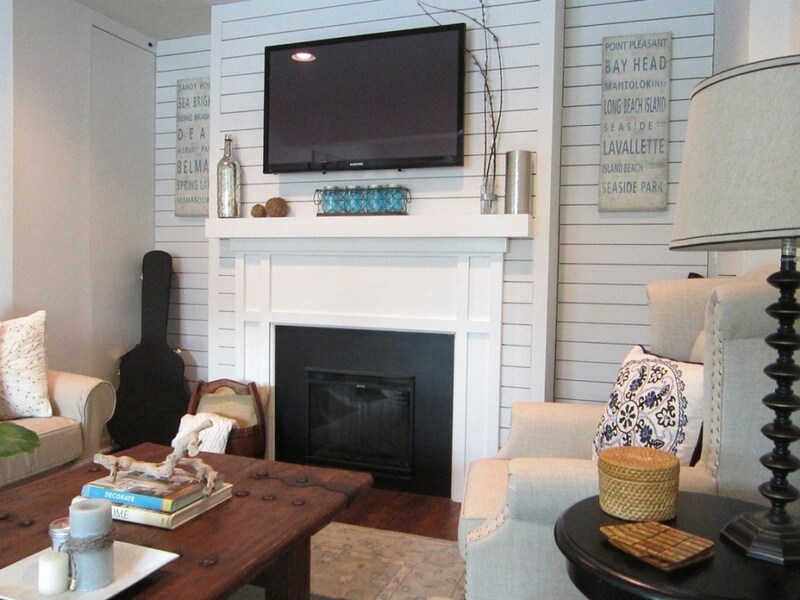 We have that soffit running across the ceiling which complicates placement for wall decor. A gallery wall would work well, but that’s not really what I want. I’m open to suggestions! I’ve also updated the mantel accessories a bit. A closer look at the mantel. 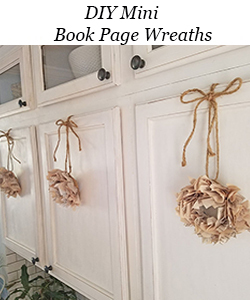 The burlap balls were a recent DIY project. 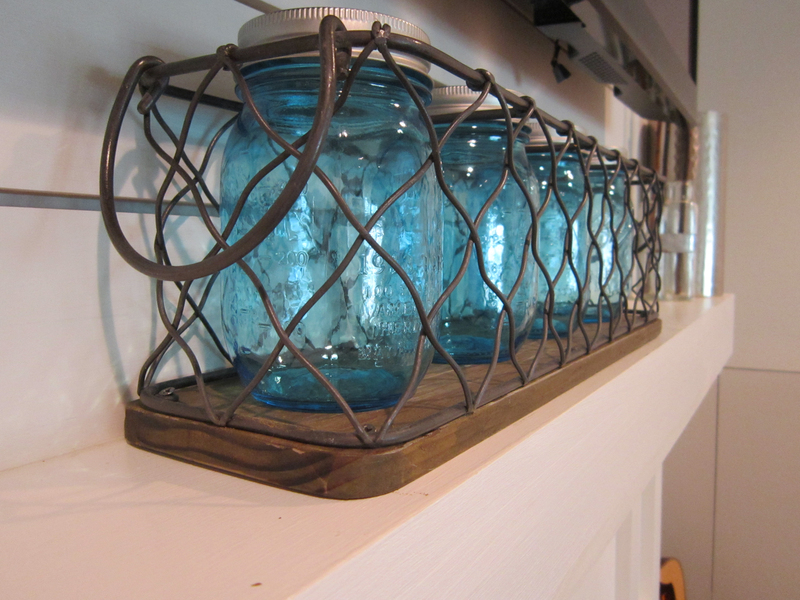 The rustic metal basket that holds these blue mason jars was found at Home Goods (surprise, surprise). I can think of a million ways to use this basket, but I really love it in this spot. I switch out the jars seasonally and add holiday decor. On the other side of the room, I moved the bar cart, which used to be my husband’s tool cart, into the corner for a while to see if I liked it better there. I still have my kitchen chairs in here for now. 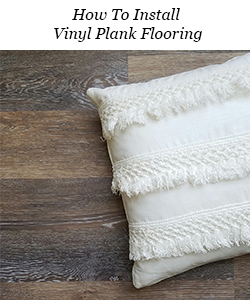 I am definitely looking to switch those out with something a little smaller and more rustic. I will probably move the bar car back to its original spot shown in this next picture. The maps were purchased on Ebay for only $20, which is an absolute steal for art like this. They came divided already so I framed them with inexpensive frames from Wal-Mart. I also added this rustic mirror over the side board. I found the mirror at Kohl’s, it was on sale and I had a 30% off coupon, it was a total score. The finish on it is amazing. As you can see, progress is slow but we are getting there. So many projects, so little time! I tend to jump from room to room, starting things and then never actually finishing an entire room. That’s OK with me because I don’t really want to be finished anyway, the process is what I love. Luck of the Irish Giveaway! I love those wingback chairs and what a score on that mirror! Your living room is wonderfully sweet. Thank you, I really did luck out with the sale on that mirror! 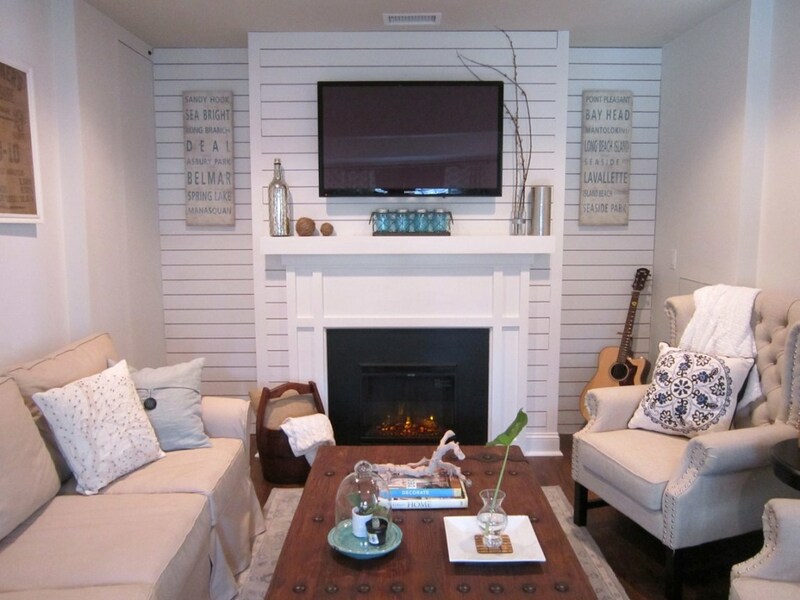 You have beautiful touches in your family room. I love the wreath you scored at HomeGoods! Is it made of metal? Changing your coffee table must have made a huge difference. I love the nail heads along the center of it…very nice. Thanks for sharing your lovely room(s)! Beautiful space, I just love the metal basket with the blue mason jars! 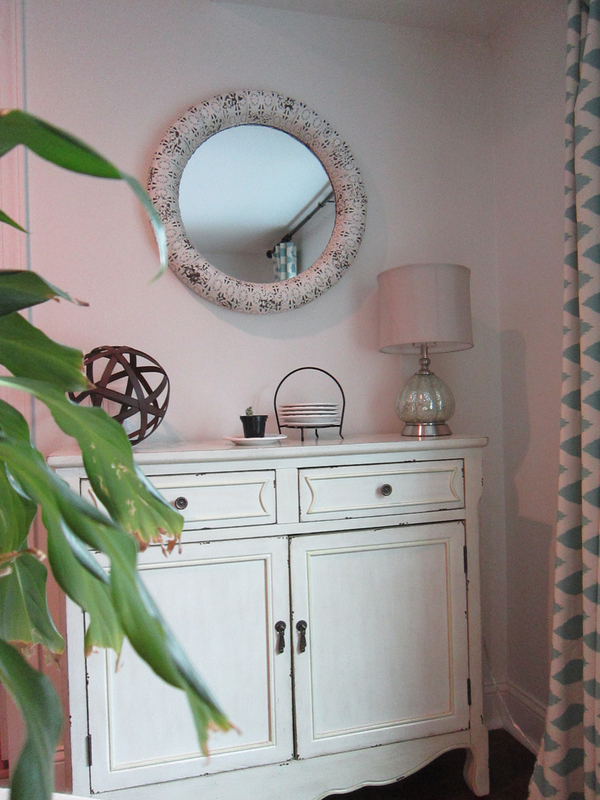 OK, I am in love with that mirror from Kohl’s! It looks so great in your cozy home. 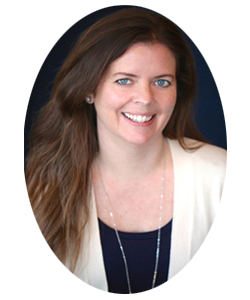 Thanks so much for sharing at Totally Terrific Tuesday this week! 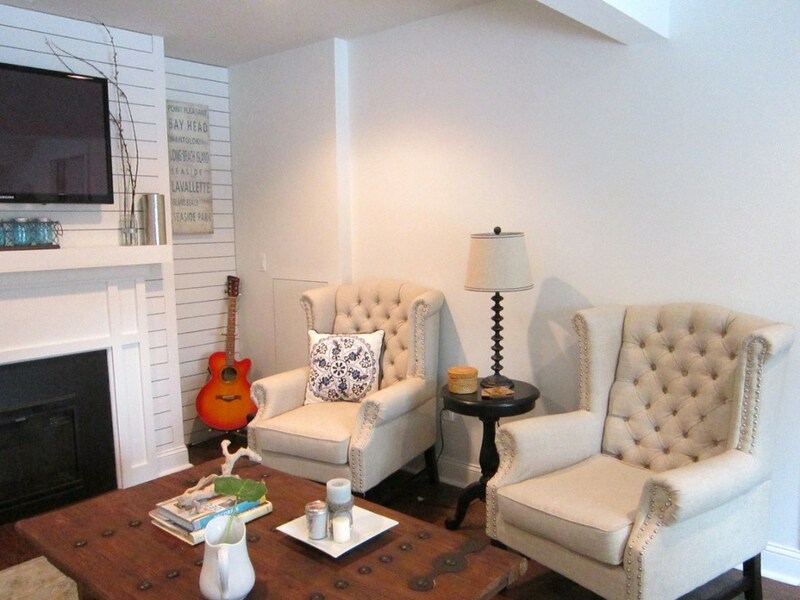 The fireplace looks so cozy in the family room! Love the blue mason jars and their holder. You did score a good deal on that cool mirror! Somewhere along the way I seem to have become a mirror hoarder. I love them and that one is no exception. It is really really cute! Awesome find! 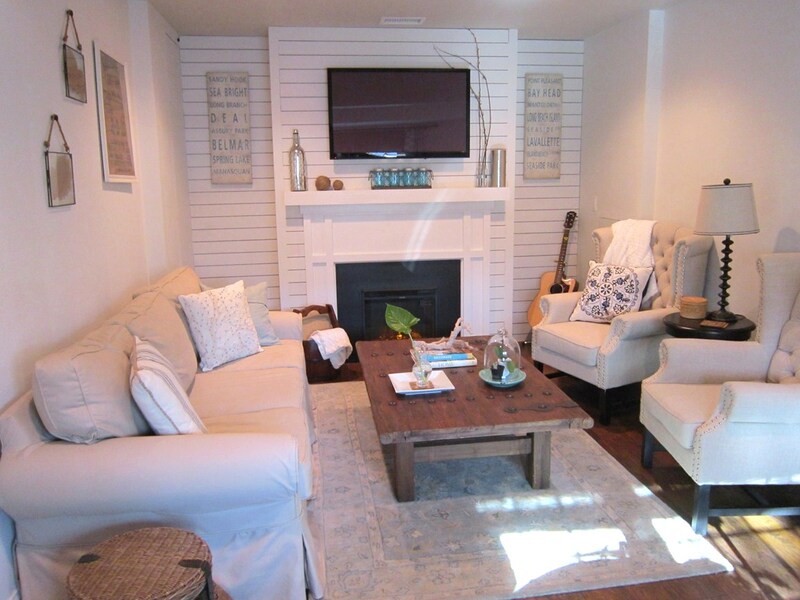 This family room is perfection! It seems so calming, relaxing, and cozy. Those two chairs are beautiful, and I love the added accessories. I think a gallery wall would like nice above the two chairs. I am in wood plank envy with that fireplace and wall. Gorgeous! I love your fireplace mantle! 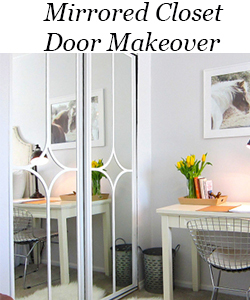 Did you DIY that? We don’t have a fireplace around ours and I was thinking of building something similar. The whole room looks fantastic! Thanks, Angela! My husband’s cousin is a master carpenter and he built the mantle custom for us! Thanks for sharing on my Friday Favorites linkup!! So nice! I love the mason jars on the mantel. Also, where are your lamps from? Love those. Thanks, Amanda! The smaller lamp is from Marshall’s and the taller I’ve had for awhile, but I believe it is from either Home Goods or Marshall’s. I am the same way. I don’t ever “finish” a room at one time. It is definitely a process. 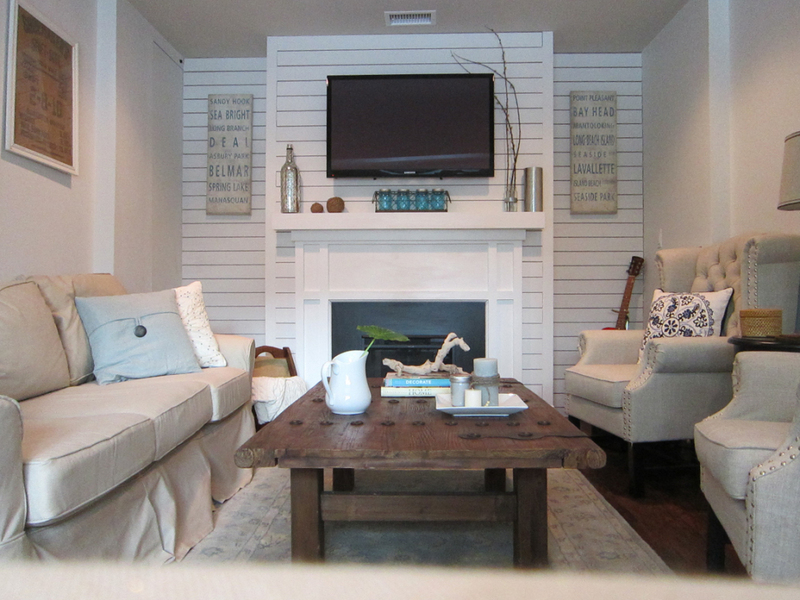 Your floors are beautiful, and I really like the addition of driftwood and blue mason jars above your mantel. Looks great! Your room is gorgeous! I love it so much! Thank you for sharing it on Show Me Saturday! Such an inviting space. And I am in LOVE with that mirror! 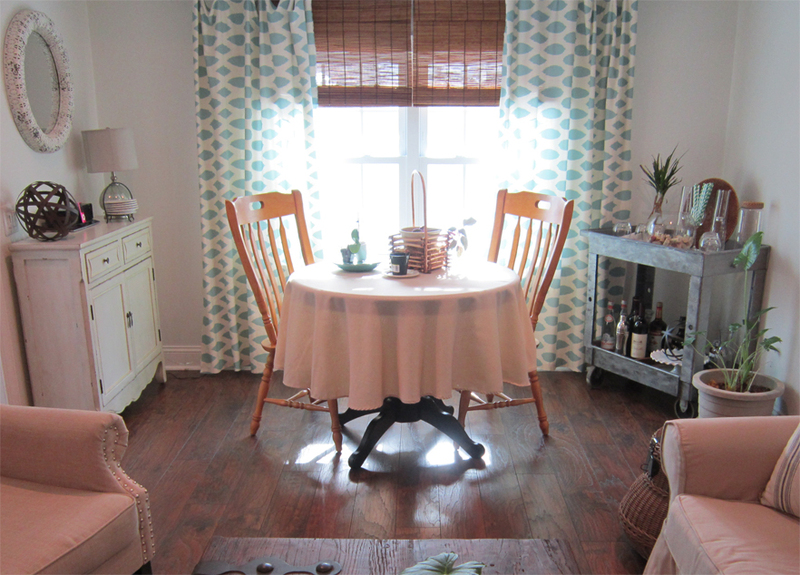 I love your sweet little living room and dining space. It looks like you have made the most with your home… living large! very nice. 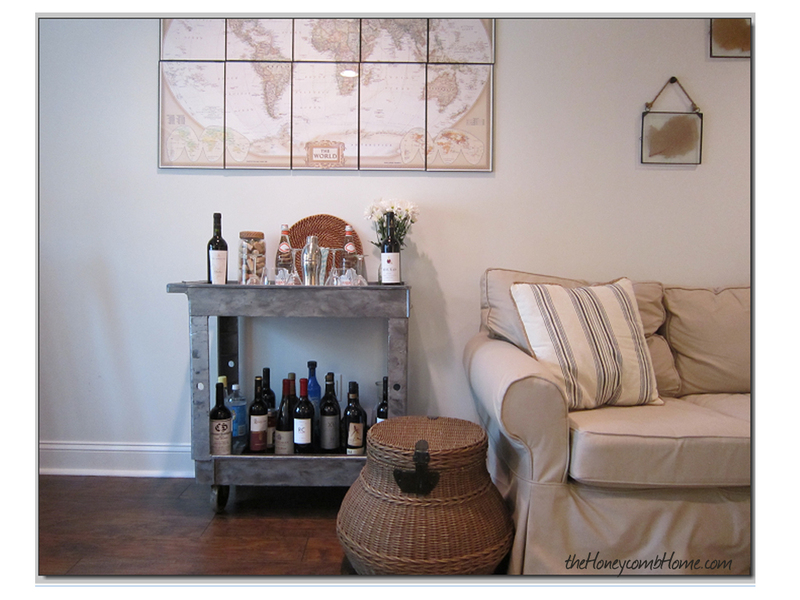 That chest coffee table… absolute favorite! 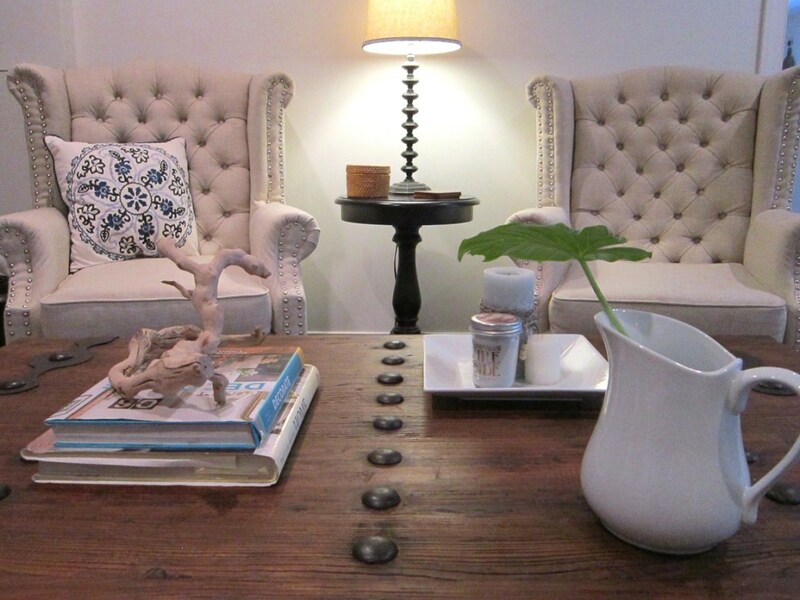 This is so cute, I love that coffee table. Great job! 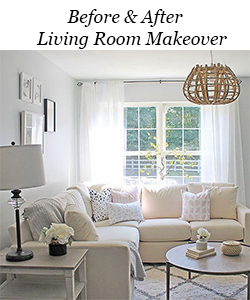 I pinned this for later inspiration as we are about to finally decorate our living room. Roxanne, you and I have such similar taste! 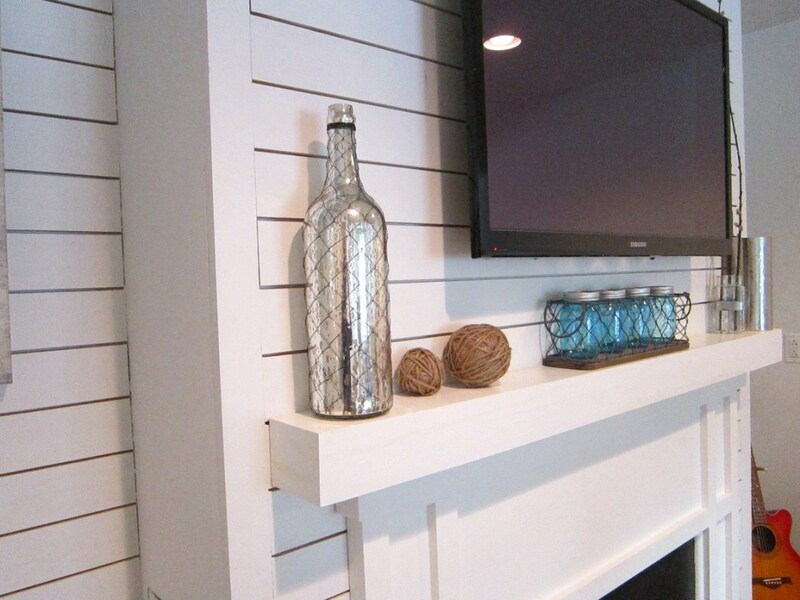 I love, love, love your shiplap accent wall and so many of your accessories (especially that cool wire basket!). Your space is beautiful! Thanks! And yes, I will. 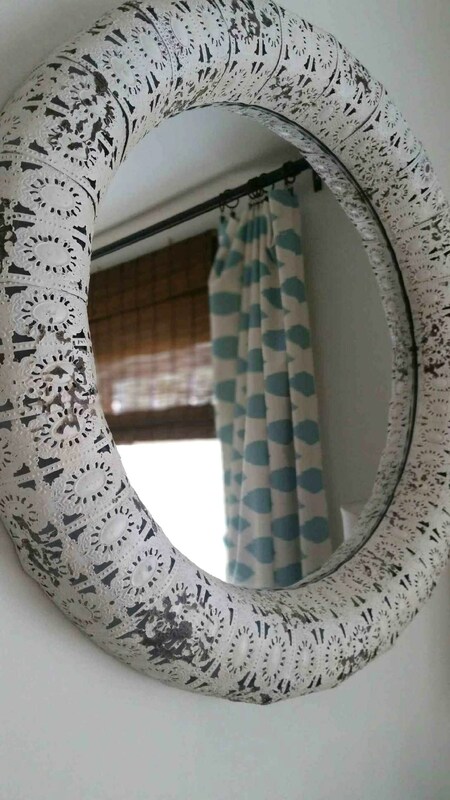 Love that mirror but what is it made out of? It looks like punched tin???? Yes, I believe that is exactly what it is made of.